The wife of a gunman who opened fire at a Pennsylvania municipal building says she is OK and that police had taken her phone as evidence. Thirty-nine-year-old Crystal Dowdell made the post on her Facebook page late Wednesday but did not say whether she had been injured in the shooting. Pennsylvania state police confirmed the gunmen killed was her husband, 61-year-old Patrick Dowdell. 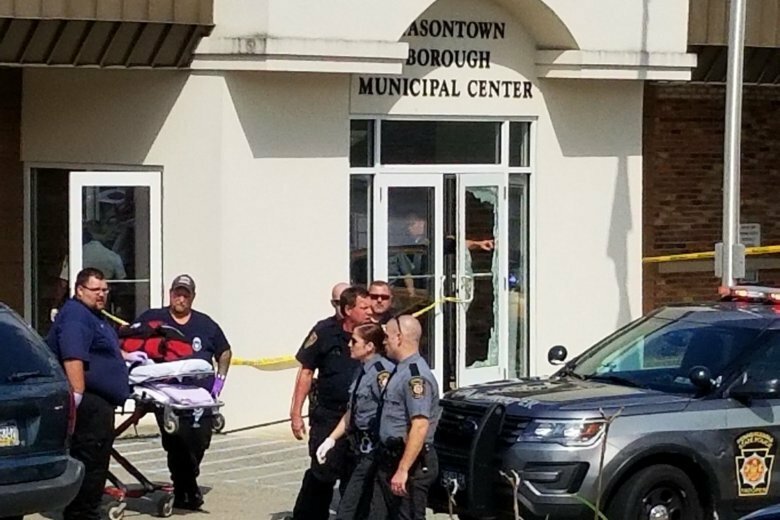 Fayette County officials say Dowdell entered the Masontown Borough building shortly after 2 p.m. Wednesday with a handgun and injured four people including a police officer. State police would not say if any of the injured people were Dowdell’s intended target. A police officer in the building fired multiple shots at Patrick Dowdell killing him. Authorities say a protective order had been granted against Dowdell related to a domestic violence incident. Three civilians wounded when a gunman opened fire outside a crowded Pennsylvania courtroom are out of the hospital. The three were taken to Ruby Memorial Hospital in Morgantown, West Virginia, following Wednesday’s shooting in Fayette County. A hospital spokeswoman said Thursday morning that the two men ages 35 and 47 and a 39-year-old woman were all released Wednesday night. Sixty-one-year-old Patrick Dowdell, of Masontown, was shot and killed by a German Township police officer. Another officer who was wounded, Masontown police Sgt. R. Scott Miller, was being treated for non-life-threatening injuries. Fayette County authorities say Dowdell entered the lobby in Masontown with a handgun drawn and opened fire. He had been due in court on charges related to domestic violence.